I know, The primary function of a salt bridge is to complete the circuit, so that charge can flow from one half-cell to the other. The second function is to balance the mass by allowing the anions to move to the half-cell where addition cations are being produced.But I can't seem to figure out what would happen if the half-cell compartments of a galvanic cell weren't connected? My electrochemical knowledge is a wee bit rusty, but I believe the salt bridge helps balance the charges and not mass. What charge you ask? So, let imagine you start up your galvanic cell (below). 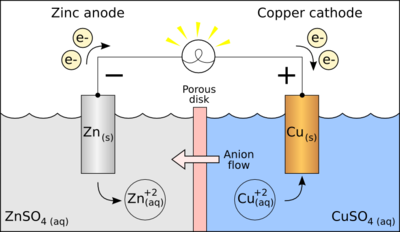 Electrons from the Zn move to Cu electrode. You start to build up a negative charge on the Cu which would resist/repel further addition of electrons after a period of time, hence production of electricity ceases. By having a salt bridge, the electrolyte ions can move from one side to the other to mitigate this issue. Is the voltmeter in a galvanic cell in parallel? Would an aqueous solution of Zn(2+) develop a positive charge if solid zinc was dipped into it?